We hear tales of bear hunters not sitting until dark and instead stand in time to get back to camp before it gets too late. CRAZY! Just like in most types of hunting, “just before dark” is usually the best time for the mature animals to arrive. Sometimes the big ones will be there well before dark, but usually the last 30 minutes of legal shooting light is the best. Carry a flashlight; the bear usually won’t eat you. They are just as afraid of you after dark as they are in the daylight. Nathan was unsure of what to expect when he arrived at Wawang Lake. He knew first hand that we produce nice bear as his father-in-law Randy had taken one the year before. Randy had planned his return visit as soon as he landed his bear and knew he just had to bring Nathan. Nathan had a very eventful first night with plenty of action….from the wolves! As he returned to camp the first night, he was so excited to tell us that he was ‘almost eaten by a wolf!’. As he sat his stand, there was a full wolf symphony surrounding him and echoing in the trees. 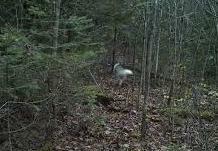 At the last minute, he caught a flash of white from the corner of his eye and caught the tail end of a wolf leaving his bait site. On the second day of their hunt Nathan got his bear. 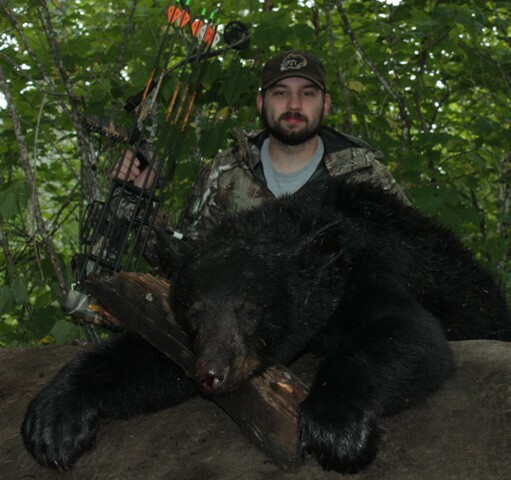 A nice 175 lb black bear and very credible with beautiful black/blue cape and all. While waiting for the others in his group to come by to pick him up Nathan amused himself by walking out to the road to see what he could see, when suddenly he saw a HUGE black bear walking right towards him. Quickly thinking, he made himself bigger by raising his arms above his head and yelled ‘Hi Bear! !”, however, his voice cracked from anxiety and came out in a high-pitched, girly, squeal instead . Just as the bear veered and went into the bush Nathan turned around and noticed a couple more bear walking out from the other side of the road towards his bait site but these ones paid him no mind. It was beginning to get dark and Nathan started walking towards the junction where he was to meet up with his hunt party, he turned and shuddered – ANOTHER BEAR and this one was glaring right at him from out of the brush just behind where he stood. The hairs on the back of his neck stood right up as again Nathan said in a high pitched voice while waving his arms high above his head, ‘Hi bear! !’ hoping to scare it off. 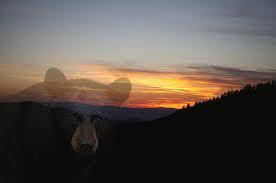 The bear disappeared back into the dark abyss of the shadowing timber. After seeing numerous bear all around he abuptly went into a hunting stance, now alert as he pointed and aimed his bow, swinging in all directions – getting ready for the attack. It didn’t happen and at that very same moment the truck drove up as Nathan sighed in relief – it was a welcome sight. It was a tense moment there for a while, one we’re sure Nathan will never forget and that he’ll repeat over and over for years to come of his encounter with multiple bear during his first black bear hunt at Wawang Lake. The truth is the bear were only interested in the bait site and the alluring, delicious smells it was emitting. It goes to show just how active our baits really are, and, Nathan got to see first hand when we say our baits have multiple bear on the baits – we’re not stretching the truth – not one bit! Scent is a mysterious and often grossly misunderstood aspect amongst those who not only pursue game with hounds or other hunting dog breeds, but all hunters in general. Scent is simply comprised of micro parti­cles of disturbed vegetable matter and/or released dead body cells drifting from the targeted subject. Vegetable matter can be crushed plant material or even minute surface dwelling bio-material living upon hard surfaces like concrete or rock. Dead body cells consist of drifting dead skin, fur or feather cells eventually falling to the ground. This may also include fluids, oils and vapors the body expels. How long does a scent trail last? That depends on given environmental conditions. The trail won ‘t exist very long if it has been hot and windy over dry surfaces. In contrast, it will sur­vive much longer in cool, moist conditions upon grassy areas with no wind exposure. “Animals can’t smell me when I apply scent-free products like special soaps, sprays or even wear scent free clothing.’ If you are liv­ing and breathing, you are giving off scent. Although these products may lessen the scent intensity from your person, a Bloodhound can find you in the woods within minutes. It is impossible for any human to be scent free. “Hounds can’t run a scent trail in the rain.” Scent parti­cles tend to be hydrophilic, meaning they readily soak up moisture and create an effluvium of scent for the canine olfactory system. Hounds have successfully found humans and animals in the pounding rain. Any good hunting breed should be able to trail game in light to moder­ate rain. “My dog sometimes ground scents and other times he air scents.” I suppose if your dog’s nose is on the ground, you can call that ground scenting and if it’s in the air, you can call that air scenting. Is it called water scenting if he sniffs a running creek or tree scenting if he barks up a tree? Scent is scent! 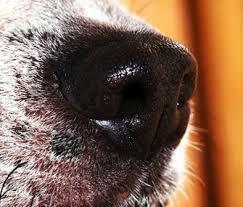 The canine’s nose is attracted to the strongest scent source available at that moment during trailing. The canine has thousands more scent receptors than humans. A roaming nose is a hunting nose; let it be. If you want to see how your dog scents, ignite a brightly colored smoke bomb outdoors with plenty of room to observe and follow the pock­ etc. of floating smoke. Watch how clouds of smoke slowly break apart, climb high into tree tops, sink down into ravines or just lazily snake over the high grass. Wind, atmospheric pressure, humidity, temperature, etc. ….all affect the smoke as it does with scent. That is why your trailing dog runs, stops, circles around, runs again ….. Let him work it out without interference from you. Scenting is his world, not yours. You can improve your game scent trailing by taking advantage of the best environmental conditions available, as well as staying away from proven scent killers, i.e…..hot and dry surfaces, vehicle exhaust fumes or petroleum products. Trying to scent a hound on a fresh track next to a chugging hunting rig is like us trying to smell a rose over a smoky camp fire. As much as we now know about scent, there is still plenty of scientific work to be done. As a hunter, you must understand how scent works whether you use a canine partner or not. Whether hunting birds or bear, scent is always there. Keep the wind on your face, the sun to your back and hunt like a predator! right now is the time to find a cure. Countless of hunters who practice shooting regularly, months before the season opens, and they still have trouble closing the deal when Mr. Big shows himself. Getting excited is fine — excitement is a big part of why we hunt — but there is a big difference between getting excited and falling apart. We owe it to ourselves to perform under pressure. Even more, we owe it to the game we hunt to stay calm enough to make good shots and clean kills. Below are six steps that have helped hunters stay cool at the moment of truth. Practice, Practice, Practice Nearly all bow hunters practice their shooting, but many fail to practice properly. To many average bow hunters, practice means flinging 20 to 30 arrows once or twice a week. This is not considered practice. When preparing for a hunt, practice every possible shot sequence, just as if you were actually hunting. That means shoot a 3D target from every possible angle while wearing camouflage, and shoot from any position that might become a possibility during the hunt. You want to be prepared for all contingencies. Also practice at distances considerably farther than you will shoot on animals. A typical whitetail shot is closer than 30 yards, but practice regularly to shoot out to 80 and even 100 yards. That kind of practice will leave you very confident for any shots closer than 40 yards. Lack of confidence is the biggest reason some people get shaken at the shot. They just keep thinking they may not make that shot. There are two things to offer those who lack confidence. One, restrict shots to your comfortable shooting range. Two, practice enough different scenarios that when an animal steps into your shooting lane, you’ll have no doubts about making the shot because you’ve already done it dozens of times in practice. Run & Shoot Now that sounds kind of dangerous, but it’s not meant in a literal sense. During practice sessions, sprint anywhere from 60 to 100 yards, then pick up your bow and try to put a kill shot on a 3D target. This simulates the adrenaline rush you get when shooting at game. Some people may think it sounds crazy, but, it builds confidence like no other drill. You don’t have to do this every time you practice, but do it often enough to build confidence in your ability to shoot accurately when your heart is racing — whether from running or from watching a buck walk within range. Flex Those Muscles! When you see a big buck coming down the trail and your heart rate skyrockets, tense every muscle in your body while holding your breath. Then, after five or six seconds, let your muscles relax, and exhale. Do this several times as needed. This is especially helpful during frigid hunts, when your muscles are stiff and your circulation is poor. It helps improve blood flow, regulate body temperature, settle your heart rate, and relax your muscles, all of which will calm you down to make a good shot. This muscle-tensing tactic has will help keep your cool on numerous animals. Focus On The Sweet Spot Once you decide to shoot an animal, you have no need to look anywhere other than the hair, scale, or feather you want to hit. Keying in on that certain spot keeps you calm and focused. Some people miss when they focus on the headgear because they are looking with their mind’s eye at a beautiful shoulder mount gracing the wall above the fireplace. Don’t worry about the headgear while the critter is alive. You will have years to stare at it — if you focus on the vitals before and during the shot. You tend to aim where you are looking. Look at those wide antlers coming your way, and you might put an arrow right through the center of them. 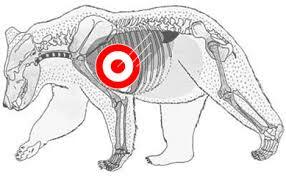 Instead, concentrate on the vitals, and that’s where you’ll put your arrow. Close Your Eyes This isn’t always an option, but when it is, it works. The longer some people look at an animal they want to shoot, the more stage fright they develop. If that’s you, closing your eyes or looking up at the sky will allow you to clear your mind and reorganize your thoughts. Some people can perform on a moment’s notice, but, others prefer to have some time to evaluate the situation and to analyze every move before actually making it. 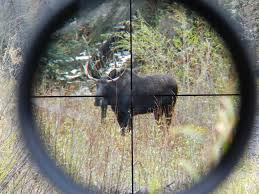 If too much time transpires and the nerves start taking over, close your eyes to regain focus before the animal gets within bow range. The Inner Voices Although you might not have demons and angels on your shoulders taunting you one way or the other, you certainly have inner voices that control your mind when you’re face to face with your prey. Listen to the positive voices and let them build you up. Feeding your mind with positive thoughts will weed out the negative ones that flow through the minds of so many bow hunters. Doubt is where many archers fail at crunch-time. To eliminate doubt, talk to yourself — positively. Black Bear are attracted to the aroma of a free meal, but if they catch a whiff of you, you can often kiss them good-bye for a day or two. Keep your clothing and footwear as scent-free as possible. Be alert at all times while hunting your bait. You will most often see bear before you hear them. With padded feet they move with calculated precision. Remember, when they come into a bait station they know the treats were left by humans. Regardless of your choice of weapon, whether it is a gun or bow, learning when and where to shoot can mean the difference between an expedited kill, or, the outcome of tracking a wounded animal. We advise our hunters to wait until the bear is preoccupied with the bait and is facing away while standing broadside or quartering away. Bears are extremely tough, so a double lung or heart shot are always your best option therefore taking your time will be important. When archery hunting, bows must meet the following specifications. there must be at least two cutting edges of straight, sharp, un-serrated, barbless steel. 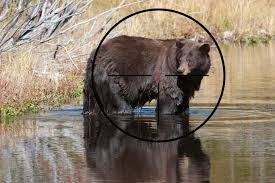 For rifle hunting black bear we recommend using nothing less than a .270 caliber. The bottom line – baiting is a proven strategy for attracting a wary game animal with a voracious appetite. It involves much more than just tossing out a few tasty morsels. There is a right way and a wrong way to do it and our experienced guides take pride in their skills and knowledge. Keen attention to detail and listening to the guide is the key to your success. In order to ensure the highest possible success to our hunters we take only an average 14 hunters a year. Should we have an increase in bear sighting throughout the spring and summer we may take a few more hunters but our first obligation is to ascertain a healthy black bear population together with satisfied hunters for years to come. Most importantly, remember baiting is a ton of work and takes weeks on our part for each hunter. From collecting legal paper work to buying and picking up the ingredients, materials along with travelling for miles and then finally establishing and maintaining each site daily prior to your hunt. It requires foresight and commitment on our part and we do this because of our passion for the outdoors and careful management of our Black Bear. Whether we are at the range shooting targets, or in the field hunting, breathing is important. We want our sight, scope or pin to be on its mark when we pull the trigger. Education, shooting positions and firearms are all very important to shooters. Breathing is a very important factor as well. We all breathe. From the day we were born we have unconsciously learned to breathe in and out. That natural motion can help or hinder during shooting. Controlled breathing is a necessity in shooting accuracy. When you breathe in and out your chest rises and falls. This movement can cause your gun barrel or arrow sight to float on its target. Your breathing may cause you to move at the exact moment you pull the trigger to fire. Sometimes when you are hunting, you get excited and/or the terrain and conditions cause your heart rate to accelerate. Your breathing becomes more rapid and harder to control. If you hold your breath, you may become light headed and your shot may be off target. 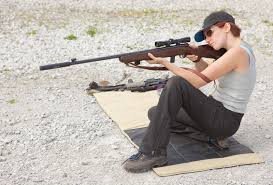 It is important to practice your breathing techniques as you practice shooting positions at the range. There are multiple methods of breathing during a shot. The best thing to do is practice them and determine which works best for you. Once you’ve determined your breathing technique, practice it so it becomes instinctive when you are under pressure. 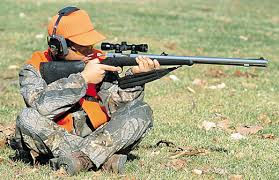 Exhale & Pause – When you are in shooting position, put your cheek against the stock of the gun. Take in a deep breath. Exhale just a portion of that breath, pause briefly and pull the trigger. The pause should allow you to hold your gun barrel and sights in perfect alignment on the target at the very moment the gun fires. Inhale & Pause – Relax and practice steady breathing. Double check your shooting position. In your rythm of relaxed breathing, inhale. When your lungs are about half full, pause and pull the trigger. The inhale and pause is similar to the exhale and pause method. Your gun barrel and sights should be in perfect alignment on the target at the exact moment the gun fires. Full exhale – Make sure you are in proper shooting position. Breathe slowly to relax. Focus on your target. As you breathe naturally, and you are at complete exhale, pause when your lungs are empty and squeeze the trigger. Breathe Naturally – Breathing naturally takes the focus completely off of breathing technique. You do not pause at all. Focus on your form and your target as you breathe naturally and squeeze the trigger. Sometimes being consciously focused on breathing can increase heart rate and breathing patterns. The natural breathing technique takes the focus off and you begin to unconsciously form a habit of correct shot timing. When you are pausing, remember just that. It is a pause, not a hold. When a shooter holds their breath, their muscles tighten and their heart rate can change. This will dramatically change the accuracy of a shot. While you are practicing, if you become short of breath, stop. Re-group and practice your natural, relaxed breathing. It is important to steady your breath to decrease the amount of movement your body is making. If you are able, step back. Take a deep breath in. Then exhale and then reacquire your target. Simple Fact: The more effort you put into masking your scent, the bigger the Black Bears coming into your target zone will be. All experienced Black Bear Outfitters have their little tricks to make their bear hunters hunt more enjoyable and also help with their success. If you are new to bear hunting you should know what you are up against. Every hunter wants a big trophy bear and this article should bring you a little closer to that goal, but remember, to thoroughly follow the advice of your outfitter, if you’ve chosen one, and, above all else: DO NOT DEVIATE from the routine they have already established. Black Bear hunting to the outfitter is about luring bears to a target zone for their hunting guests by baiting with food the bears like such as high-carbohydrate foods. Bread, pasta and other high starch content foods are rare in nature but it’s what the bears want most so they can quickly store fat for the winter. It’s also about setting up stands at strategic spots where big bears have been scouted. Black Bear hunting for the hunter is all about stealth, with the two biggest factors being sound and most of all, smell. The Black Bear has the best sense on smell of any land walking mammal on Earth. It’s really hard for a human to comprehend how well a bear can smell as we basically have to stick our nose in the pot to smell the sauce. Comparing the amount of Olfactory Receptors between a human and a Black Bear is mind boggling. Olfactory Receptors are microscopic bulbs on the end of nerves in a mammal’s nose. The more you have the better your sense of smell is. 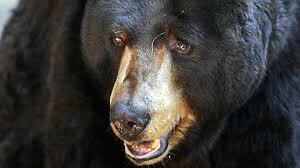 A Black Bear can smell 2100 times better than a human. In addition the Jacobson’s organ in their mouth can taste the air, adding to their brains perception. 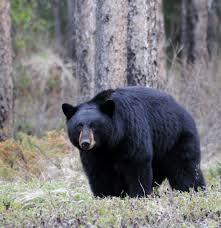 A mature Black Bear can smell your breakfast from 20 miles away if the wind is right. Big mature bears can smell better than smaller younger bears as their noses are larger and more developed. Bears also know what unnatural smells are and associate them with a human presence. This can explain why Black Bear hunters that are not fanatical about the way they smell rarely see big trophy bears. 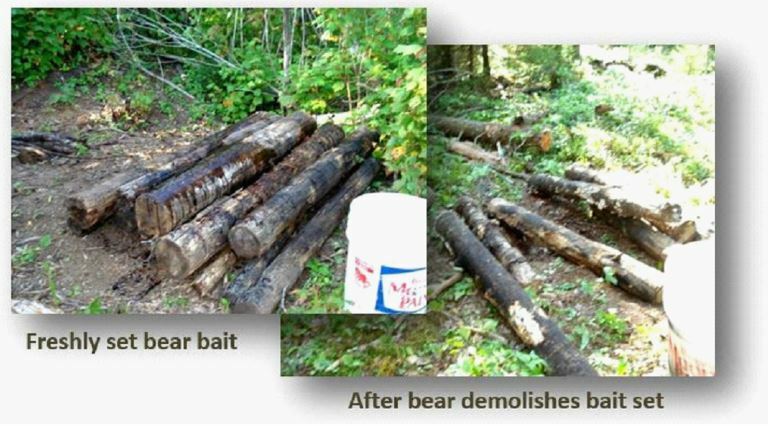 There are procedures you can do to minimize unnatural smells to keep the bears concentrating on the bait that the outfitter has put out for them. It is wise to check with your outfitter before applying anything new to the bait station that they normally don’t use. 1) Before your bear hunting trip; pick a couple of sets of clothes that you will only wear at the tree stand while hunting. Wash your clothes with scent-free detergent and when done, run them though the wash twice again with no detergent so they are well rinsed. This will ensure your clothes are scent free. If you live in the city and have chlorinated city water then go to a pet store and buy a small bottle of Aquarium Water Conditioner and add ½ oz. to the last rinse cycle you do with your clothes. The water conditioner will neutralize the chlorine in the water and keep the chlorine smell out of your clothes. Remember, they can smell 2100 times better than you so don’t feel silly getting fanatical. Then pack the clothes in a plastic bag to keep them scent free. If you consistently use fabric softener in your clothes dryer it’s best to hang your clothes up to dry because residual clothes softener might go on your clothes. If you are a smoker, do not smoke while wearing your hunting clothes. Before we go to the next points you should be aware that Black Bears love the smell of mint. If you go on a camping trip in any of Ontario’s provincial parks the wardens will tell you not to keep mint toothpaste or mint gum in your tent because the bears will smell it and go after it. The bears craving for mint can be used to your advantage. 2) Think Mint: Go to one of those hippy tree-hugger heath stores and buy mint soap. The morning before the hunt take a shower using the mint soap. Brush your teeth with mint toothpaste. Chew mint gum while in the tree stand and if you really want to go all the way, have a glass of mint tea before the hunt and even keep a few bags of mint tea in your pockets. This will help cover up any scent. 3) Smoking: If you are a smoker and you smoke in the tree stand you are basically wasting your time if you expect a big trophy bear to come within sight. Wind direction can give you a little luck but it’s not something you should count on. It’s best to wear a nicotine patch while in the tree stand and if you need to; chew mint gum to keep your mind off smoking. Remember to brush your teeth and wash your hands and stop smoking before you put your scent free hunting clothes on. This would also apply to cigars and chewing tobacco as well. The shape of Black Bear’s ears is mainly responsible for their great hearing. When detecting sound based on volume a bear’s hearing is about four times that of a human. However, a bear can hear a much broader frequency range; both higher and lower frequencies. Rubbing of cloth or twisting of your tree stand can produce sounds that the bear can hear and the hunter cannot. Big old male bears develop a crowned head and their ears move out to the sides giving them stereoscopic hearing, which allows them to pinpoint the origin of the sounds they hear. This is another reason why big old bears are harder to get. With this in mind try to stay absolutely still. If you have to move; move very slowly. Take some nose drops before the hunt and if you have a cold or allergies. If your throat is dry and itchy bring some mint flavored lozenges with you. You can also oil the joints of your tree stand to make them a little quieter. 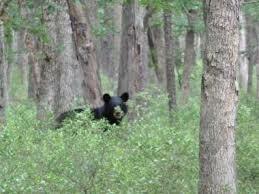 During the day a Black Bear basically has the same site as a human but older bears tend to be near sighted. As a result they cannot focus on things from a long distance. When one of an animal’s senses becomes diminished their brain rewires itself to compensate by making other senses more acute. This is known as neural placidity. As a bear gets older they become near sighted so the brain compensates by being more sensitive to color differentiation. If the bear sees colors it thinks are unnatural and he sees those colors move the game is up. Bears cannot see the same range of colors as a human. Hunter orange looks gray to them. But they can see dull reds and yellows as well into the blue/green cool color spectrum. This is why there are many different forms of camouflage clothing. You need to talk to the outfitter when you book your hunt and ask what kind of plants will be at the tree stands. If the hunt is taking place in the southern range of Ontario’s bear hunting country during the fall you may have a mix of coniferous and deciduous trees, thus you will need a camouflage that represents pine needles, pine bark and colored fall foliage. If you are father north in an area with only pine trees you will need a camouflage that represents pine bark and pine needles, which means dark brown and green. You need to blend into the scenery so their bear cannot see any unnatural color pattern. 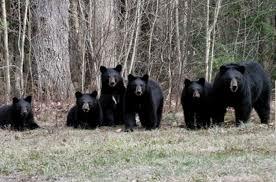 Black Bears are nocturnal. They have a reflective layer in the back of the eye called the tarpetum lucidum. Just because you can’t see them does not mean they cannot see you. Since dusk is the hottest bear hunting time it’s also when you should concentrate the most on being quiet and motionless. When a sow is with cubs, 90% of the time the cubs are in the lead. The cubs will make more noise than a single bear. Most of the time, adult bears make little or no noise. You can’t shoot a sow with cubs in the Ontario spring hunt, and in the fall we continue this policy on our BMA – DO NOT SHOOT SOWS with cubs.. So make 100% sure you know what you are shooting at. Take a really good look around to make sure there are no cubs. A sow’s ears are usually closer together, as a male bear’s cranium grows wider on top and the ears look farther apart. They also look smaller, which is really an illusion. These tips and techniques are just a guide line for some things to consider and think about. Ultimately the outfitter is the person you need to discuss the different factors with. Bear hunting can be quite different in different regions.